How Accessibility And A Responsive Website Design Are Related? 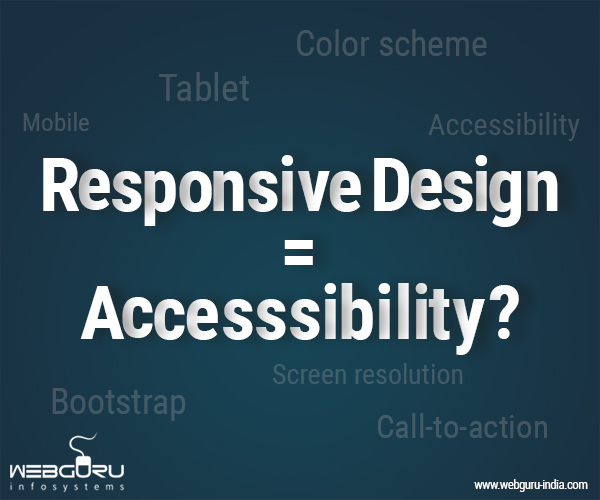 Responsive Website Design and Accessibility – Are They Related? Websites serve as a viable source of information in today’s world. Imagine a world where you visit a website but do not get the information you were looking for. Or perhaps the website failed to load properly, thus leaving you with an even more bitter experience. This is especially applicable in the case of mobile devices as websites are more prone to losing out functionality. However, people do not like to compromise on their web browsing experience, which is why mobile adaptability and responsive features can be a major deal-breaker. A responsive website surely makes it more accessible to visitors but the reverse is not true. The whole point of a website is to provide some sort of information to the global audience. So if the information is not accessible, it nearly diminishes the whole utility of the website. Incorporating responsive design elements into the website can vastly improve accessibility, while also adding functionality to it. There are numerous elements of responsive website design. Starting from flexible grids to resizable images and CSS media queries, there are numerous tweaks which can be implemented into a website to adapt it to different devices like computers, tablets and smartphones. And all these can contribute to improved accessibility of the website. Can Responsive Design Improve Accessibility? To cut long story short, the answer is yes. Responsive design improves the way the website adapts itself to different screen sizes, thus making it a better experience for mobile users as well. Texts, images and other website elements appear as they are supposed to, when you rotate the screen or visit the website from your tablet. This, in general, enables a much better user experience. Correct placement of website elements ensures the user finds exactly what he is looking for. However implementing responsive design is not the only way to make a website accessible. The usability of a website depends on a variety other parameters. Right from the layout of the website to the content, a lot of factors work together to create a user experience. Choosing the right colors for the website, using appropriate call-to-action buttons and incorporating proper textual content can contribute to better accessibility. About two-third of the global population have access to internet these days and more than 60% of the internet users own a smartphone. In the past few years, there has been an alarming increase in the rate of internet users on smartphones. To keep up with this growing usage, it has become extremely important for businesses to make their websites responsive. This basically prevents their businesses from losing out on the entire populace of smartphone users. A responsive design enables a website to adapt itself to the device it is viewed on – be it a smartphone, tablet or a computer, without hampering its form and functionality. These modern websites make use of flexible grids to ensure the layout does not break when the device is rotated or when it is viewed on a smaller or larger device. The use of resizable images also ensures that they can scale according to the size of the screen without breaking their form. All these make the responsive design very important if you want to keep up with the modern age of users. This certainly aids in improving the accessibility of a website irrespective of the device it is viewed on, but is not the only factor which makes the website accessible. As mentioned before, there are several factors in play when considering the accessibility of a website. Choosing the colors is one of the main deciding factors when considering the accessibility of the website. Improper use of colors can have an adverse effect on the visitors, leading to a major drop in customer engagement. It is also wise to bear in mind that a lot of people around the world suffer from color blindness and would find it difficult to keep track of a lot of colors splashed across the website. Additionally, call-to-action buttons should be in line with the rest of the colors on the website. They should be prominent and noticeable. Contextual text also proves to be extremely useful for driving conversions. Instead of writing “Contact Us” or “Click Here”, something like “Let Us Help You” can be much more beneficial. There are several other design related tweaks which could be incorporated into a website to make it more attractive and accessible to the users. Using tabbed indexes, fixed headers, a ‘move to top’ button, proper alt tags, etc. can be a few effective ways to boost accessibility on a website. A website that does not function properly or sports improper design is not the most accessible. With more and more features getting added to websites every now and then, there is a lot to discover. These days, website designers and developers are trying to blend proper layout, design, features and content with mobile responsiveness to make it extremely fluid and usable. And that should exactly how it should be. Accessibility is very important for a website. Being a visitor, I would never want to browse a website that lags or that doesn’t display the content properly. And I think responsive design is also important for every business as a lot of people use their smartphones to surf the web. I am not very sure how responsive website contributes to accessibility, except on mobile phones and tablets, but it is surely important to keep up with the modern users. I think there are much more important factors, as is mentioned in the blog. Yeah responsive means accessible. Responsive web design means user friendly, device friendly and seo friendly. Your article is very helpful for the beginners. Your blog description about responsive web design and its accessibility, is completely derivative. Really a interesting and helpful article about Responsive web design. Responsive web design create a single site to support many devices.It is user friendly, device friendly and seo friendly. Thank you so much for publishing with us…!!!! Responsive design improves the way the website adapts itself to different screen sizes, thus making it a better experience for mobile users as well. The responsive design very important if you want to keep up with the modern age of users.